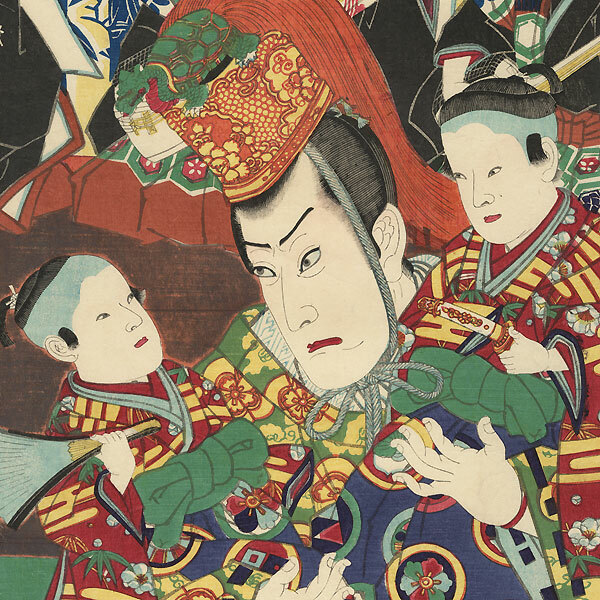 Comments - Handsome kabuki triptych showing a nobleman carrying two young boys in his arms. He looks at the younger child with gravely, his face an expression of concern. The older boy sits atop his shoulder, a tiny sword in his hand, both children dressed in elegant matching kimono. 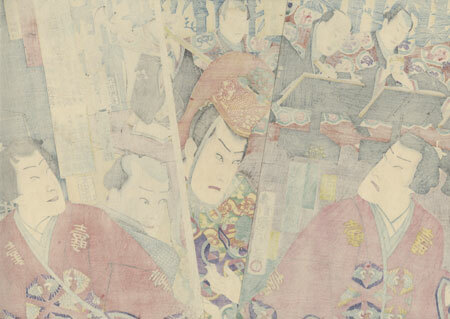 The nobleman wears an elaborate headdress topped with a turtle, a symbol of longevity. An attendant stands before him, holding a fan, while his sword bearer brings up the rear. Musicians play koto on a platform behind the group, with readers seated as small lecterns. A Noh theater prop sits at far right, topped with a pine tree. An intriguing scene with beautifully drawn faces. Nicely detailed with burnishing in the black kimono and the black lecterns, and embossing on the hilt of the sword. Condition - This print with excellent color and detail as shown. Three separate panels. A few small holes, repaired. Slight soiling, a few creases. Please see photos for details. Good overall.